The Useless Junk that Took Over the World! Think outside the box - especially these boxes! 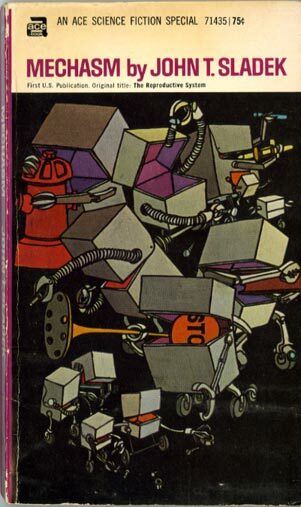 Isn’t this simply great cover art by Leo and Diane Dillon? It’s simple and it’s great. Definitely not the usual, slick, computer airbrushed, “realistic,” illustrations I see on most of you Earthlings’ Sci-Fi/Fantasy book covers here in the early 21st century! Not that there’s anything inherently wrong with those; I guess it’s just the sameness of them all that bothers me. The back cover blurb mentions Kurt Vonnegut, and this book is very Vonnegut-like; A social satire. The Mechasm is/are boxes that feed on energy and eat all metal to make copies of themselves, enslaving humans to it’s service – even those that thought they were it’s masters. And remember, this was written before the age of the home computer! Today we know the real “Mechasm” is even more insidious than John T. Sladek thought it was back in 1968. Here’s a good update to this terror tale: The Story of Stuff. Watch it and you’ll doubly appreciate the hipness of cheap, USED books!